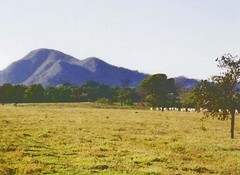 Here's another photo from our trip to Brazil, taken at the fazenda on July 31, 1994. Rene took us on a surprise morning ride while Sandra got things ready for the big Brazilian barbecue that was happening later on. I can't look at this picture without smiling. Rene loves to tease. and we certainly gave him plenty of opportunity, what with the twenty five years since our last ride, the language barrier (with people AND horses), and my inability to tell left from right in any language. The ride was hilarious, beginning to end. When we finally got back to the house, I confessed to Rene that I wasn't sure I remembered how to dismount. My friend said, "You will, Madame," tied the horses to the fence, and went inside, leaving me stranded in the saddle, laughing too hard to breathe. Today we went to a wedding, got caught in bad traffic, and were almost late enough to accidentally become part of the wedding procession. I was very glad we made it. The bride is lovely and so was the wedding. I would have loved to stay a little bit longer, but we had to leave before the dancing started. 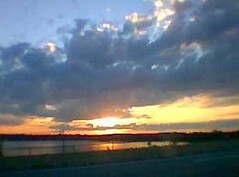 As we drove home, the sunset was so amazing that I tried to capture it from the car with my phonecam. I guess that shows that there's more than one way to celebrate. I missed the dancing, but I caught the light show. Here's the latest version of the painting for my friends. In the last version, the ivy next to the windows went all the way up to the roof. Now it just frames the windows. I also added some ivy to the back of the house. Then I modified the dormer windows, changing the point at which that structure intersects with the roof. In addition, I added detail to some of the doors and windows, and worked a little more on the tree on the left, and the sidewalk. More to come. . . This picture was taken in 1994 on our trip to Brazil, but tonight I scanned it into the computer and cropped it to improve the composition. In late July of 1994, we went to Brasilia to visit close friends that we met in 1968 at college in Boulder, Colorado. We met in married student housing; we were newlyweds and so were they. We had always stayed in contact, but until 1994 (about 25 years later) never managed to make it down to Brazil. We had only been in Brasilia for a day or two when we all piled into the car and drove to their beautiful fazenda (ranch). We walked through this field (see the cattle in the background? 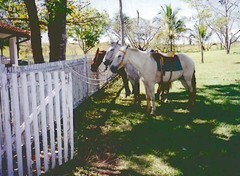 )and then went horseback riding. What a great day! We had waited for such a long time to visit, and it seemed like a dream to finally be there. Time for another picture from Portugal. I love the old houses in Porto, with tile roofs and pastel colors. 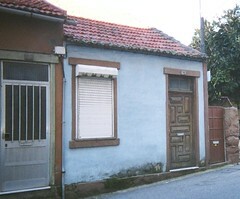 During my visit last November, I saw this little blue house in Vila Nova de Gaia in Porto. Someday soon, I hope to do a watercolor based on this photo, and when I do, I will include a little old lady coming around the back of the house carrying groceries, which is what happened just as I was taking this photo. This is the latest version of the painting for my friends. Today I worked on the roof, and using the old black and white photo of the house as a guide, put some vines in next to the side windows. I took this picture with my phonecam during an outing to Long Hill Gardens last week, and tonight I cropped the image to focus on these three July blossoms. I love daylilies. Just when it gets so hot that you think nothing could possibly bloom, the daylilies open. Today we met Mindy in Portsmouth for a quick lunch. But she and I did find a few minutes to talk about our mutual passion for making jewelry. Mindy brought some of her work along to show me. 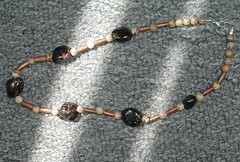 And I brought along this necklace that I made a few months ago, and gave it to her as a gift. This is the latest version of the painting for my friends. I have been working on the roof, making the shingles smaller and flatter. (There is more to do.) I have also worked on the upstairs windows, and continued work on the tree on the left, to make it more balanced and three-dimensional. 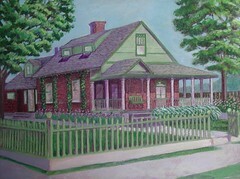 Still to come: more work on the roof, and then vines. 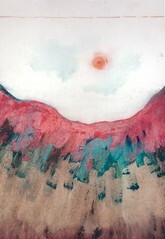 It's time for another painting inspired by the mountains of Colorado. This is acrylic used as watermedia on watercolor paper. These are paintings that are based on imagination and memory, not observaton. The color isn't realistic, or is it? When the sun hits those mountains, they turn the most amazing colors. This is a photo of Mel looking at the ocean from the Provincetown Beach during our trip to Cape Cod a few summers ago. There's something about the ocean that makes you want to slow down, and just enjoy the passage of time. I decided to post this tonight, but needed to edit it. 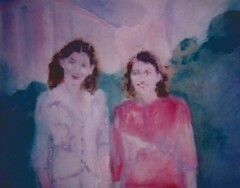 When the photos were developed, the color was off, creating a strangely green sky and pink sand. So I toned the colors down somewhat, but left some of the pastel colors alone for the effect. Next, I cropped the image to get the composition I wanted. Then I used digital watercolor in Painter IX to darken Mel's shirt for more contrast with the ocean, and got rid of a pesky sign on the railing. A lot of trouble for an image of a fleeting moment on the beach, but photos can help us stop time and keep those moments. Take a look at the picture, and you are back on the beach. It has been really hot here, and today I finally had a chance to go swimming and cool off. Well, actually, I was floating rather than swimming, and enjoying myself by watching the late afternoon light hit the trees and the water. I wanted to take a picture of the beautiful abstract patterns the reflections made on the water, but I didn't have a camera handy. So later I cropped this image out of a photo I took several years ago of a motel swimming pool in Avalon, New Jersey, which may sound like an unlikely place to find art. But I think you can find art everywhere, if you pay attention. Next time you get in the swimming pool, keep your eyes open, and look. This is the latest version of the painting for my friends. 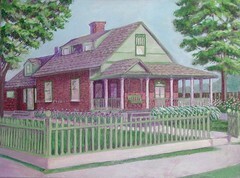 This morning I painted in the changes on the upstairs dormer windows, and also worked on the trees. The tree on the left had been threatening to fall over; I decided that it needed another branch to make it balance, so I grafted one on. Here's one more picture from our trip to Scotland last July. We stopped in New Abbey to see the Sweetheart Abbey, and I loved the little town. Tonight I cropped this image out of the original photo to eliminate a delivery van. Then I edited the image in Painter IX to move a pesky planter that was in the way. I call this image a fantasy because it is digitally modified, and because without the delivery van, it invites a little travel in time as well as space. I took this photo with my cellphone a few weeks ago, on a more leisurely day than this one, and decided to post it tonight. This is an image of passing time, and for me, today is full of deadlines. I am very aware of the rush of time as I work. We tell time with clocks, but our eyes and bodies tell time with light. It helps me to look at the sky as a natural clock (like our little dogs do). The sky reminds us that time is moving, but it isn't moving against us; we can move in harmony with the sky's time, if we choose. I took this picture in mid-July of last year as we drove through the Highlands of Scotland, heading for Sterling. Tonight I cropped the image for the sake of the composition. (Because I took this photo from a moving car, I had to edit out the car's interior!) The highlands were beautiful and made me homesick for the mountains of Colorado. The fog was very dramatic and the landscape was surprisingly empty, (no towns, nowhere to stop). And ever since that trip, a cold day in July is no longer a just an expression. The raspberries are ripening outside my window, so today I went out to capture a photo of the berries as they change color from red to purple. I used both my cell phone and my digital camera. 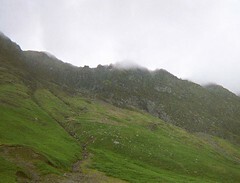 This is the best of the lot, from the digital camera, which shows a little more detail. 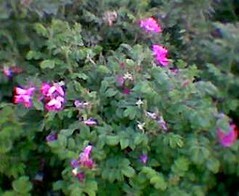 (It's hard to get close to the raspberry bushes, which are all thorns.) 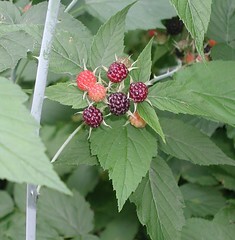 Tonight I cropped this image to focus on the shape of the branch and the graceful cluster of raspberries. If you want raspberries, you have to put up with the thorns. Today I worked on this painting for my friends. Before I got my paints out, I made a sketch of what I think the upstairs windows look like, based on what I can see in the photos, and e-mailed the drawing to my friends. I will use their feedback to revise those windows and then finish the roof. Meanwhile, I worked on some other parts of the painting. I extended the pattern in the brick, already painted on the side of the house, to the brick on the front porch. Then I made the trees behind the fence recede into the distance. I worked a little bit on the trees, pruning some branches and shoring up the tree trunks. More to come. 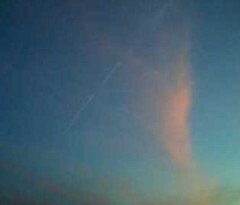 . .
As of today, I once again have a working phonecam and I used it to take this picture, which I later cropped and edited in Painter IX. Tonight we went to a get-together in Durham, New Hampshire. The house is surrounded by trees and the late afternoon light was amazing. Impatiens was growing by the doorway. 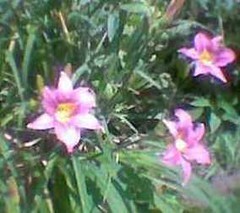 It is one of my favorite flowers. 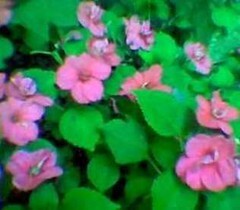 Impatiens thrives in the shade, against all odds producing bright color out of shadow. It's time for another picture of Portugal. This is an image from a visit I made to Porto a few years ago, but tonight I cropped it to improve the composition. 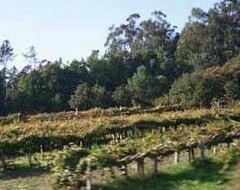 I saw many vineyards like this around Braga and Porto. Although this is an "ordinary" scene in Portugal, it isn't ordinary to me. Last July, we took the ferry from Belfast to Scotland and spent a week there exploring in a rented car. 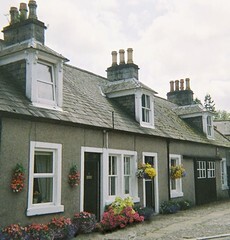 I wanted to see Loch Lomond, and finding the beautiful village of Luss right beside it was a bonus. 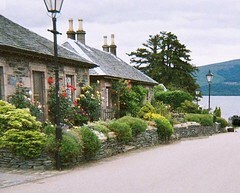 Tonight I cropped this picture and did a little digital editing in Painter IX to focus on the cottages, the gardens, and Loch Lomond in the background. Tonight I did a little work on this painting for my friends. I needed to shorten the brick wall on the side of the house and move a window on that wall. These changes were for the sake of improving the perspective, but as a bonus, now there is more room to show the side entrance. I was able to add the window on the other side of that door. I also added some shadow to the sidewalk and worked on making the iris easier to see. I wanted to do more, but time was short and I had to stop. But for me, it is better to make art every day, even for a short time, than to wait for a long stretch of free time to come by. It's been raining all day, but I took this photo with my phonecam about ten days ago, on a sunny afternoon at Long Hill Gardens in Beverly. But I never got around to posting it. Then two days ago, my cellphone broke. Luckily, the preceeding day I had loaded all my saved images into my computer with Blue Tooth, and I am waiting for my replacement cellphone to arrive. Meanwhile, today I found this phonecam image saved in my computer. But there was a reflection in the water that was distracting. To fix it, I opened the image in Painter IX and darkened the reflection with digital watercolor. 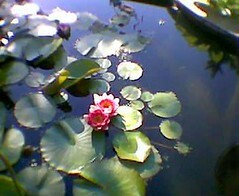 I'm glad I saved these waterlilies for a rainy day. 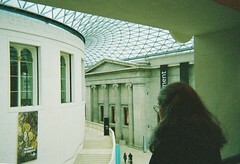 Mel took this photo of me at the British Museum last year, and today I cropped it and adjusted the contrast to get it ready to post. After far too long a wait, I finally got to London for far too short a time. I rode on top on the double-decker buses and minded the gap in the underground. I was delighted by the London Eye and I winced at the Gherkin. The people who live in London come from all over the world, and so do the people who visit. None of us had to pay admission to get into the British Museum. I was there. I will be back. . . . Here is the latest version of the painting I am doing for my friends. Today I did some major renovations to correct some problems: worked on the roof, moved the upstairs windows, and actually moved two chimneys. Not a bad day's work. I also worked on the trees, trying to get them to leaf out more. After all, it's already July. Two cousins are visiting, so very late this afternoon, I showed them some of the beaches and ocean views on the North Shore: Singing Beach, Hospital Point, and Lynch Park, where I took this picture of beach roses with my phonecam. (Tonight I cropped it just a bit to improve the composition.) Along the way, we ran into two open-air concerts, one near the gazebo at Manchester-by-the-Sea, and the second amazed us as drove up Route 127, right on the edge of the water near Endicott College. Very nice coincidences for a very nice day. 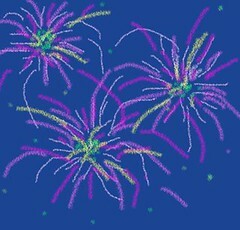 I made this little drawing of fireworks with digital pastel in Painter IX for a quiet little Fourth of July, and I can set them off now, even though it isn't dark yet. After dinner, Mel suggested ice cream at one of the terrific local ice cream stands on Boston's North Shore. Two treats in one! I love ice cream, and I love to go out when the sun is going down (or coming up for that matter). I love to see the effects of the light and the colors in the sky. In anticipation of some early fireworks displays happening tonight, many cars were parked on the shoulder of Route 128. But a spectacular light show was already going on overhead, the kind that is available twice a day. 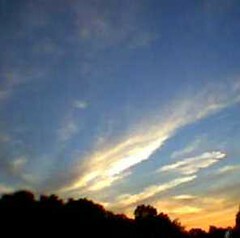 So I starting taking pictures of the sunset with my phonecam. Some might ask why bother to take pictures of something we can see all the time. My answer is that when we travel, we photograph things we notice or want to remember, some of which are spectacular and historical, and some of which are ordinary to those who live there, but not to the traveler. Well, life itself is a kind of journey, with amazing things to see. Taking pictures of what is around us, whether we are close to home or on the road, reminds us to pay attention. Art can make us travelers every day. Today I went with Mel to take a peek at his new office at the University of New Hampshire. 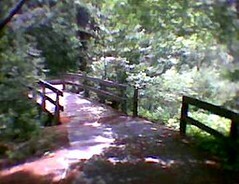 What makes the campus unusual is its setting, with paths between buildings criss-crossing the woods. I took out my phonecam as we explored a path or two. I like this image the best. Would you think that you are in the middle of a campus? At UNH, as students walk from a classroom to the student union, they can walk across a footbridge over a little stream. This is the latest version of the painting for my friends. The shingles on the back part of the house are new, and I planted the iris today. 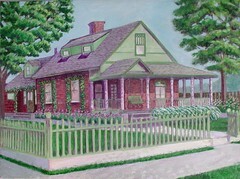 I also corrected some problems I had noticed, fixing the size of the windows on the side of the house, and the structure of the front porch, and even moved a column. I want to correct anything that might bother viewers over time. I want my friends to enjoy looking at this painting when it is finished.